There are so many howlers in the expert assessment of Rembrandt’s nudes that I will limit myself to the two splendid drawings reproduced on the cover of the Getty Catalogue. On the front, is a drawing that is still accepted as by Rembrandt; on the back cover is a better drawing which is now re-attributed to a moderately accomplished student, Arent de Gelder. Both drawings are quite obviously not only by Rembrandt himself but of his mistress, Hendrijke Stoffels: furthermore these drawings are quite clearly investigating the pose of Rembrandt’s painting “Bathsheba” in The Louvre. No previous reputed scholar has had the effrontery to doubt either before. It is almost besides the point that Rembrandt clearly loved her – we love her – because she is reality framed, simplified, clarified to penetrate the human brain. Through hinted geometry we can find our way across that soft, once muscular back, the nuances of the tone in the shadow, as the light strikes across her back, allows us to caress every limp muscle and protruding bone. This drawing teaches us to love and accept nature as she is – not to fly off to some imagined stereotyped goddess. This is Rembrandt’s gift to us: life as it is – miraculously lovely. Here in fig.3 below you see how the figure fits into a block of space (suggested by the plastic frame). The figure conforms to the two sides of the block and her stool gives us the hint that the light confirms. See how her head reaches over to touch the light plane of the block, as does most of the figure. The shadow side is parallel with the back of the stool. Once you see the space every mark that Rembrandt makes on the page is accurately legible within that space. He gives all that is necessary for a sculptor to find the figure in a block of stone ( my figure is modeled in clay). Because the space is so clear the forms within it can be perfectly understood. In fact I prefer this pose to the final version of Bathsheba; the turn of the head away from the indecent suggestion this married woman has received from King David, seems superbly appropriate. 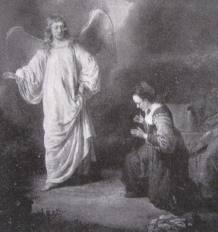 We cannot see the letter that is needed to explain the subject and it is probably this that made Rembrandt go for the front view. While the drawing that is still a Rembrandt is clearly of the same model in nearly the same pose, the geometry is not quite so secure. One can see that Hendrijke has slumped forward a little during the pose. Her distant shoulder has been redrawn lower down. This would have necessarily lowered and swung forward that breast as well but Rembrandt has not made that adjustment, so the front plane of her chest does not quite mesh with the side plane. A very small slip, which may be difficult to see and which those that can see, can easily forgive. Thus the Getty“experts” are suggesting that de Gelder is more reliable in his geometry than the master. They go on to say “ de Gelder” (the great drawing) “is weaker in the illumination and the rendering of form… above all, it is highly improbable that one artist would draw the same model from the same pose twice”! Highly improbable as it may seem to the “experts” I do it whenever my enthusiasm is aroused. Moving round the figure demonstrates the sculptural side of Rembrandt’s genius. Mr. Giltaij, of the prints and drawings department in Rotterdam, finds “the modelling of the back gives the impression of being over detailed and cautious…the contours (of the figure) are weak and hesitant” such appalling misjudgements are confounded by my ability to make sculpture from the drawing. In the Getty catalogue the “experts” re-attribute three other former Rembrandt nudes to de Gelder, although the one “sure de Gelder” according to them, is of Jacob being shown Joseph’s blood stained coat (a typical and much tried Rembrandt subject. It is not a great drawing but nonetheless I would guess Rembrandt’s. How can they guess it is by de Gelder with no drawing to compare it with?) They must be stopped! Now! Form is a somewhat hidden ingredient of art. Brancusi made it his life’s work to expose form to public view. He dared to call an egg a head, thus demonstrating the classical Greek form of the head. He made these abstract simplifications the final aim of his art. It is also generally agreed that Brancusi was in strong reaction to the work of Rodin and others of his generation, whose work by contrast seemed to be formless but it is not. Rodin very seldom subscribed to the simple Greek idea of the head. He followed a different tradition of form that we might designate as Roman, as it made its way into Europe following ancient Roman conquests. Very many great artists followed the Roman tradition subconsciously. Rodin would have received its influence not only from the Roman work that abounds in Europe but from many French devotees from Gothic times onwards – Clouet and Houdon were masters of it, and in his own time – Degas, Lautrec stand out. Today’s art critics and historians need to become more aware of this second tradition of form , which is, if anything, more prevalent than the Greek tradition because it is much more useful for analyzing the complexities of nature. I think it would be true to say that no artist can be considered even of the second rank without subscribing to a tradition of form. Form is a vital ingredient of art. Form is nature simplified so that the human mind can comprehend it. More important than form is the development of a sense of structure. Structure is the logic with which multiple forms are held together. In sculpture structure is usually to do with the way the building blocks defy gravity. In archaic figures, for instance, the structure is the same post and lintel architecture as the temples they adorned. Classical form is based on the simplified cylinders and cubes which underlie Greek classical sculpture. Their structure is defined by what we all know of the human body – what it can do – and what it cannot do. This is the form that art historians more or less understand. But Rembrandt found that the classical Greek tradition had descended into a stale academicism, moreover, it was too crude spatially to deal with the subtle psychological relationships that interested him. 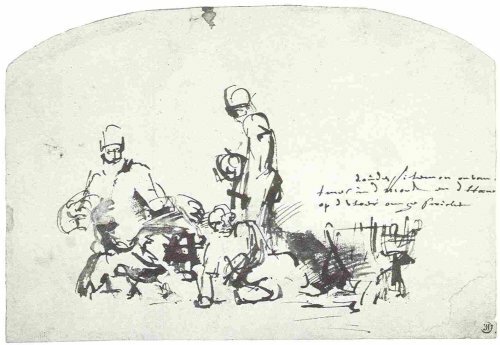 Rembrandt’s greatness as a draughtsman rests on his extension of the Roman tradition. Rembrandt studied the solid that was so exquisitely defined by the geometry of Holbein and the Romans and extended that geometry to include the intimate space that is so essential in reading psychological situations in the physical world. Rembrandt not only owned 30 Roman portrait busts, he filled two books with studies of them! Alas, these books have been lost. If Rembrandt scholars could understand that this structuring of space, is where Rembrandt’s greatness lies; we could return to the complete, great master we once knew. Rembrandt’s style of “handwriting”, which so dominates Rembrandt studies today, is quite irrelevant to his greatness. Added to which my Burlington Magazine article of Feb. 1977 demonstrated that their understanding of Rembrandt’s style of handwriting was absurdly wide of the mark. 33 years later, instead of those grave mistakes, we have the atrocities of the Getty show (as outlined in Getty 1- 4 below) which have deprived more than a generation of artists of their greatest master of gestural expressiveness: body-language, and much else. They must be stopped! I am working on a DVD which I hope will help the experts on their way to a better understanding.